This retired couple contacted us to replace their pool liner. The wife questioned if there was any way to make the patio not fall in around the pool coping every year causing her husband to spend 1-2 weeks re-leveling every spring. As visible in the Before picture, the un-level yard is quite evident. What started as a simple liner replacement ended up as a complete overhaul with a new liner, paver patio (laid over a concrete pad), and a waterfall spa cascading into the pool. Now, every time we open, the couple is very happy as all they have to do is set out their decorations, vacuum the pool, and turn the heater on. Check out our Patio page for more information! Check out our Fencing page for more information! Check out our Liner page for more information! 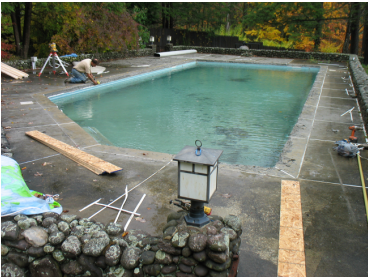 The owners of this 1960s concrete pool were looking for a way to give their pool a new, and different look. Using the Artistic Pavers Renovation Coping as well as the Tumblelock Patio Stone, we created the more modern look they desired. Additionally, we also replaced their chain link fencing with black aluminum allowing the pool area to still blend with the country style home. Does your pool look like this? Did you know that filling in the pool is now more expensive than renovating it? Allow our team to provide you with ideas to change it from a headache, to your backyard escape. With our design team, we are happy to provide you with a plan, be it all at once, or in stages to have an enjoyable yard again. 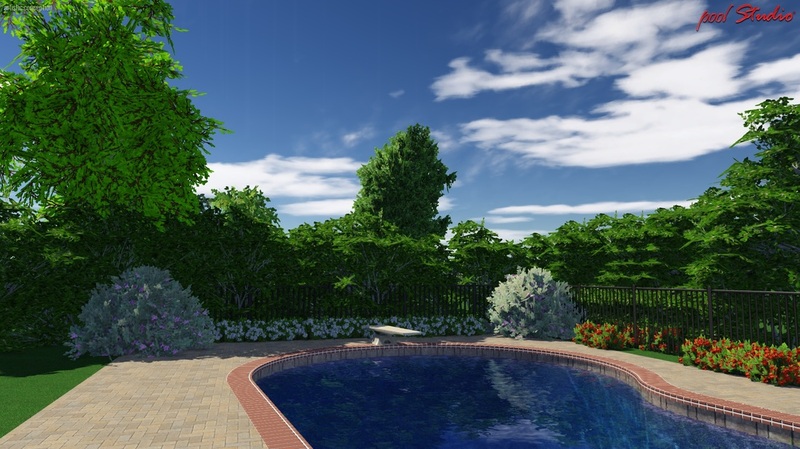 With Pool Studio, we can envision your dream with just a click! Check out the video below to see what Pool Studio can do!